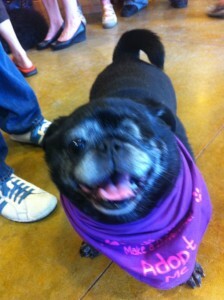 Lucy Lou is a 9 year old black female pug weighing in at 26lbs. From Foster home – I wanted to give an update on the beautiful Lucy Lu. She is such an doll.. She is house trained and is doing really well.. She is wonderful with our kids and she is a lover. She loves to be right by you so you can pet her and rub her belly. She is very quiet and for being overweight and middle age you would not know it! She rolls around on the floor and loves walks! I have noticed her tail curls when she is happy/excited. She is super sweet and is going to make someone very happy.. I just can’t say enough good things about her..